How to resize a layer in GIMP keeping the layer transparent while resizing? 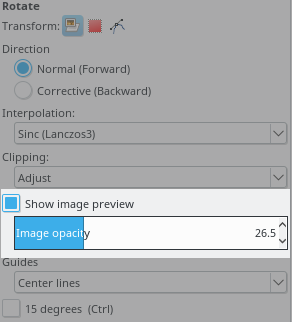 For some reason every time I start resizing a layer gimp turns the opacity back to 100, how can I resize a layer so that it stays at it's opacity while I'm in resizing mode? Actually the same question applies to Perspective tool as well, it too resets the opacity which makes using it to align to images rather impossible. Shown here with the Rotate tool, since it is a common feature of all "Transform" tools. This setting can of course be saved (Edit>Preference>Tool options>General).